Over the past few years, widespread attention has been given to “green” building and sustainability. Sustainability includes, at a minimum, both energy efficiency and recycling. Industry leaders are addressing this topic much more frequently as interest in it expands. At the American Society of Heating, Refrigerating and Air-Conditioning Engineers (ASHRAE) convention this past January, a seminar and two forums were offered on sustainable design and green topics. ASHRAE plans more programs on this subject in the future. At the National Insulation Association’s (NIA’s) annual convention in March, two speakers addressed the specific role of insulation in sustainable design. The talks included a look at how thermal insulation can contribute to green buildings, as well as information on Leadership in Energy and Environmental Design (LEED)–certified buildings. The speakers noted that reducing energy use through greater efficiency is not enough: Society also needs to recycle materials to a much greater extent to achieve greater material use efficiency. Within the insulation industry, that means increased use of recycled materials in the manufacture of insulation and more recycling of insulation materials after their use. Possibly the most successful and well-known recycling effort in the insulation industry is the recycling of old newspapers into cellulose insulation. While primarily used as building envelope insulation, cellulose insulation uses a large percentage of recycled materials—reportedly in the 80- to 85-percent range. According to the Cellulose Insulation Manufacturers Association, in 2004 (the latest year for which figures are available), the industry produced 773,000 tons of cellulose insulation. Mineral wool insulation is typically a blend of rock wool and slag wool. Slag is what is left from coke and iron and is the predominant input material to most mineral wool insulation. If slag were not recycled, it would be sent to landfills, further aggravating the landfill problems that already exist. According to the North American Insulation Manufacturers Association’s (NAIMA’s) website (www.naima.org), in the past 10 years, nearly 11 billion pounds of recycled blast furnace slag have been used in the manufacture of slag wool insulation. In the fiberglass insulation manufacturing industry, recycled scrap glass—mostly from bottles—is used as an input raw material. According to www.naima.org, in the past 10 years about 9.5 billion pounds of recycled scrap glass have been used in the manufacture of fiberglass insulation, making up about 40 percent of the input material. One fiberglass insulation manufacturer claims to have used 3.5 billion pounds of recycled glass during the past 10 years. As with unused slag, if the bottles were not recycled into fiberglass, they would be dumped in landfills. The 2001 Insulation Outlook article titled “Recycling Fiberglass Insulation Into Commercial Board Products” (see www.insulation.org/articles/article.cfm?id=IO010701) described a fiberglass insulation recycling technology that converted post-industrial scrap material into usable fiberglass boards. In that wet process, post-industrial scrap fiberglass insulation was shredded, mixed with water to make a slurry, and then passed through a “head box” (similar to that used in making paper). There, it was drained on a conveyor chain, soaked with a chemical binder solution, dried, and pressed and cured in an oven into 4- or 5-foot-wide boards with a finished density in the range of 3 to 10 pounds per cubic foot (lbs/ft3). This valiant effort to recycle post-industrial scrap was successful in making a quality product, but because of start-up problems, as well as marketing and sales issues (recycled products did not have the appeal and acceptance then that they do today), investors finally shut down the operation and auctioned off the equipment. Once the facility was shut down in 2002, most of the scrap fiberglass insulation material from the operation went to a landfill. Scrap fiberglass can be used for more than just fiberglass board products. 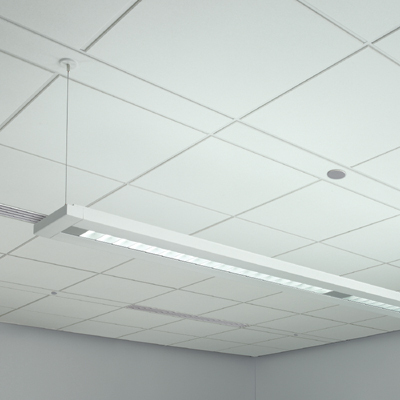 One commercially successful reuse is as an input ingredient for fiberglass acoustical ceiling tiles. At least one manufacturer of these tiles—Armstrong World Industries based in Lancaster, Pennsylvania—uses old fiberglass ceiling panels, a form of acoustical insulation. This keeps the old ceiling tiles out of landfills and puts the material to good use. The company’s website (www.armstrong.com) states that since the start of its recycling program, it has recycled almost 11 million pounds of fiberglass ceiling tiles into new fiberglass ceiling tiles. The website also asserts that the company has reduced CO2 emissions by 11.2 million kilograms, saved 12.3 million gallons of potable water, reduced landfill waste by 24.5 million pounds, reduced electrical energy use by 34.3 million kilowatt-hours (kWh), and reduced virgin raw materials by 245 million pounds. These numbers should inspire other successful insulation recycling programs within industry. Armstrong has undertaken a number of recycling projects. A supermarket chain is recycling 2 million square feet, or 600 tons, per year through the company’s recycling program, for example. In Florida, an office park being refurbished is recycling 25 tons of old acoustical ceiling panels, turning them into new ceiling panels. The new ceiling panels have 79-percent recycled content. A New York City corporate headquarters for a large pharmaceutical company, which is being renovated, is in the process of recycling 160,000 pounds of old fiberglass ceiling panels into new ones. Another company, Rastra (www.rastra.com) recycles plastic foam insulation, such as polystyrene, into structural building blocks used for houses and other buildings. It makes insulated concrete forms (ICFs) from cement and post-consumer plastic foam. Rastra claims to have 85-percent recycled content (by volume) in its block product. The high percentage of polystyrene content by volume gives the ICFs a higher R-value than regular concrete block, which in turn increases the overall wall R-value. Its standard steady-state R-value per inch is reported to be 1.73, giving each 14-inch-thick block an R-value of 24.2. The manufacturer claims that the effective R-value is considerably higher—as high as 46 in the Arizona desert—due to daily temperature swings. Rastra reportedly is recycling almost 200 tons per year of plastic foam insulation material at its Albuquerque, New Mexico, plant and will soon be opening a second plant in Columbus, Ohio. The manufacture of mineral wool and fiberglass insulation is energy intensive. Any materials that can be recycled, without requiring the melting of input materials, can save large quantities of energy otherwise used to melt and fiberize the materials. The manufacture of plastic foam insulation materials, while not energy intensive from a thermal perspective, is material intensive in terms of using petrochemical feedstock (such as chemicals made from crude oil). Prices of natural gas, crude oil, coal, and nuclear fuel have tripled in the past 5 years. As these prices continue to increase, recycling becomes even more attractive financially. With growing concerns about global warming—which results from the release of CO2 into the atmosphere—recycling is a way to reduce energy use for the manufacture of construction and building materials. When recycling of insulation materials is combined with the increases in energy efficiency realized by thermal insulation in buildings and industrial processes, the contributions to a more sustainable society can be enormous. In the next 5 years, new insulation recycling projects likely will be developed and commercialized. The insulation industry will increasingly contribute to a more sustainable society, which will increase its value to the world. That is good for business! 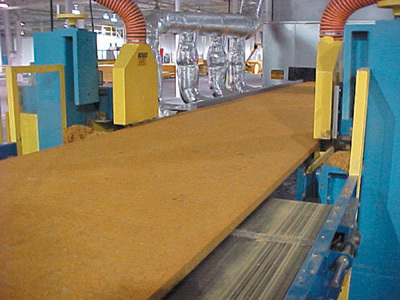 A recycling technology once converted discarded fiberglass insulation into acoustical and thermal insulation board products. 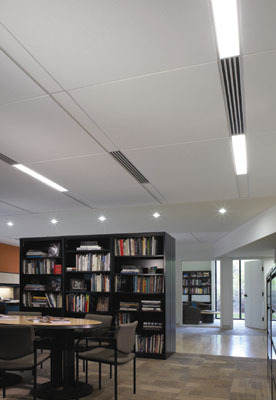 Ceiling panels like these can be made from older, recycled fiberglass ceiling panels.